The KPI library is an account-wide library that stores all KPIs that you wish to save. It allows you to store all KPIs in a single location, and apply them to any company. Note: Only ‘Admin’ level users have access to create or edit Library KPIs. For more information on User access, see User roles and permissions. There are several uses for the KPI library. Fathom provides a number of predefined non-financial KPIs. You can quickly add these KPIs to your company by selecting them from the KPI library. Some commonly used KPIs are absenteeism, customer satisfaction, new customers, and more. Note: Fathom does not automatically pull in data for these non-financial KPIs. For more information on how to import non-financial KPI data, please view this guide. If you wish to use a custom KPI in the future with other companies, you can save it to your KPI library. You can then easily select a previously created KPI from the library, rather than having to recreate it. This saves time when setting up a new company. Custom KPIs MUST be saved to the KPI library in order to be used in your consolidated and benchmark groups. A Library KPI must be added to at least one underlying company in order to flow through to the consolidated group. See below for instructions on adding a Library KPI to a company. You are able to add any custom KPIs to the KPI library when you first create them in 'Step 4 - KPIs'. 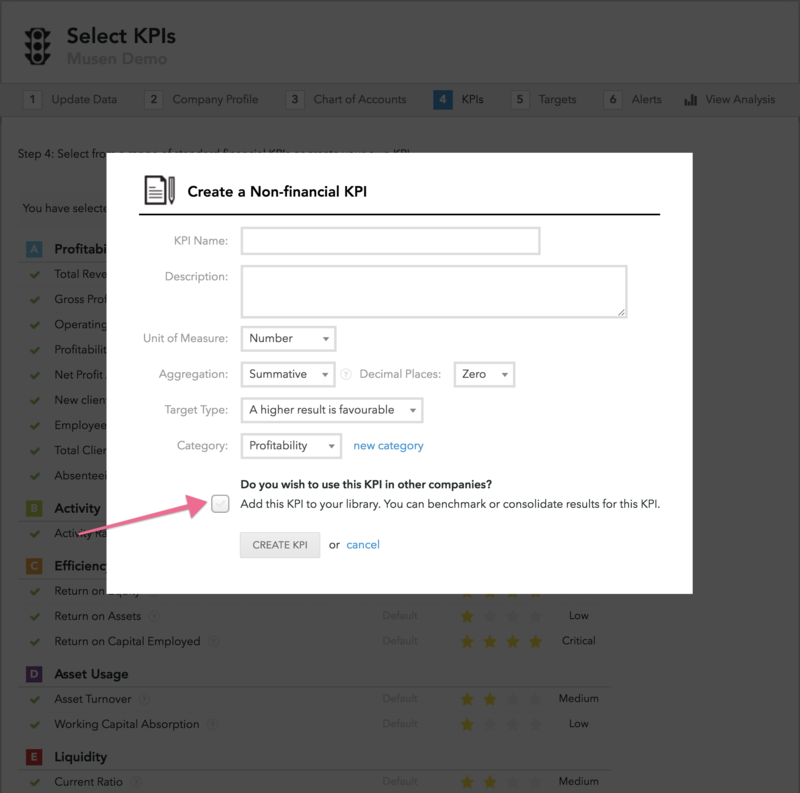 Select 'Create a KPI', and create any Non-financial, Account watch, Formula, or Tracking KPI. In the following window, you will see a checkbox option to 'Add this KPI to your library'. The KPI library can be accessed from 2 locations. You are able to access the KPI library within 'Setup > Step 4 - KPIs > Create a KPI > KPI Library'. Accessing the KPI library from Step 4 enables you to quickly add a KPI saved in your KPI library to the company. Note: This option is only available to Admin level users. Admin users can access the KPI library from the settings menu (cog icon), located in the top right of Fathom.